Posted in Surface and Pattern Design. RSS 2.0 feed. What a good approach, leaving you with some really interesting patterns. Love the sense of height and perspective you have captured here – the orange looks great with the emerald. Good luck with all your endeavours for 2013. Beautiful Karen, love your version of the theme, it feels unique! I like how you’ve gone back to your roots with the architectural inspiration! Especially love the 2nd pattern. Best of luck for 2013. Great idea and designs Karen : ) Best to you in 2013!! wow, fantastic take on perspective. can see this on lots of interior products! Very cool…takes me to another dimension, really wonderful! I so loved your interpretation as it really brought out the artistic Architecture in you. Architecture, Form Space and Order by Francis D.K. Ching. 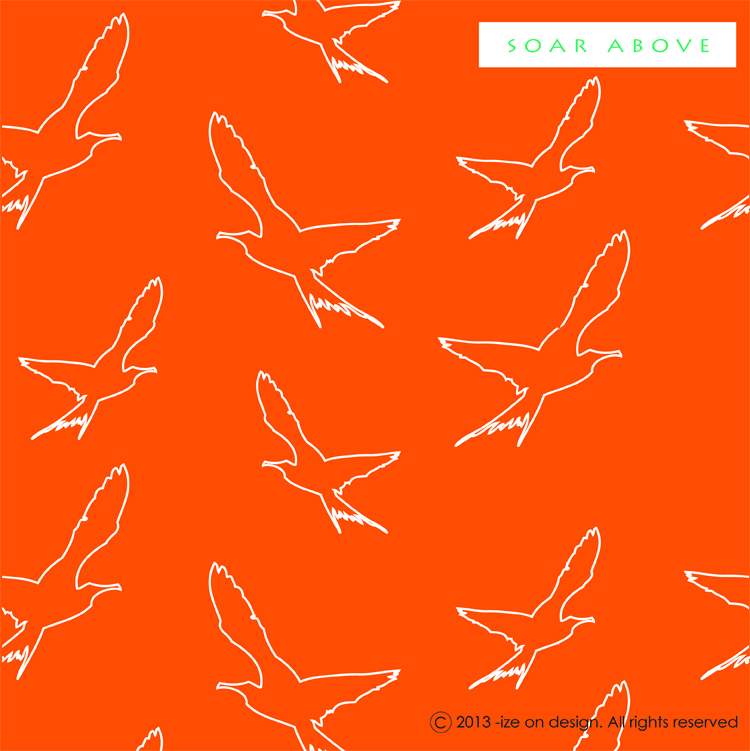 loving ‘soar above’. a great design in my favorite color! I didn’t know you were originally trained as an architect! 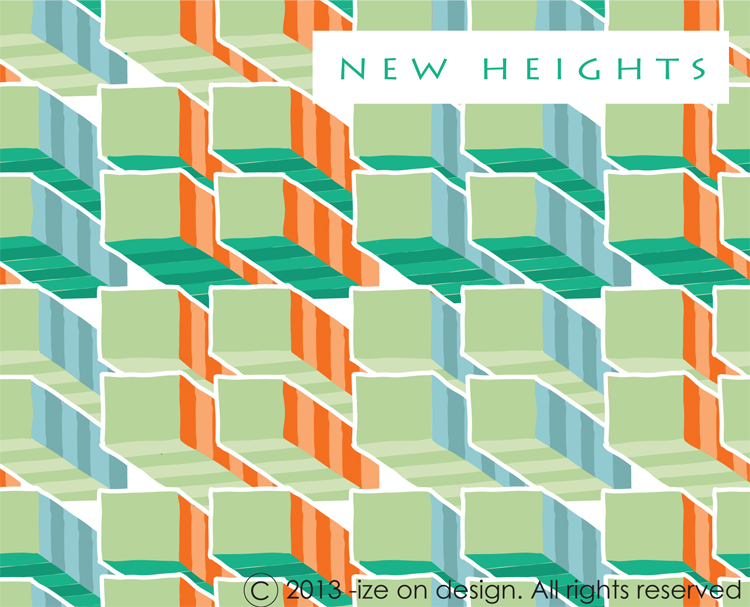 I love your take on “flight”, and your colors that you used (especially those two muted greens) are such great choices to mix with the emerald….adding the orangey colors makes everything POP! Love them! What a different take with great results. Congrats! Just beautiful. Love the use of orange, my favorite color! Your graphic style really shines through your collection.Just love it. “Mondrianesque”…love that! Very unique take on a theme, love what you’ve created! Great designs Karen! That middle print is fantastic and the colours are phenomenal! Love your inspiration for this collection Karen, and especially like ‘New Heights’ and ‘Soar Above’! Wishing you all the very best for 2013! Beautiful! 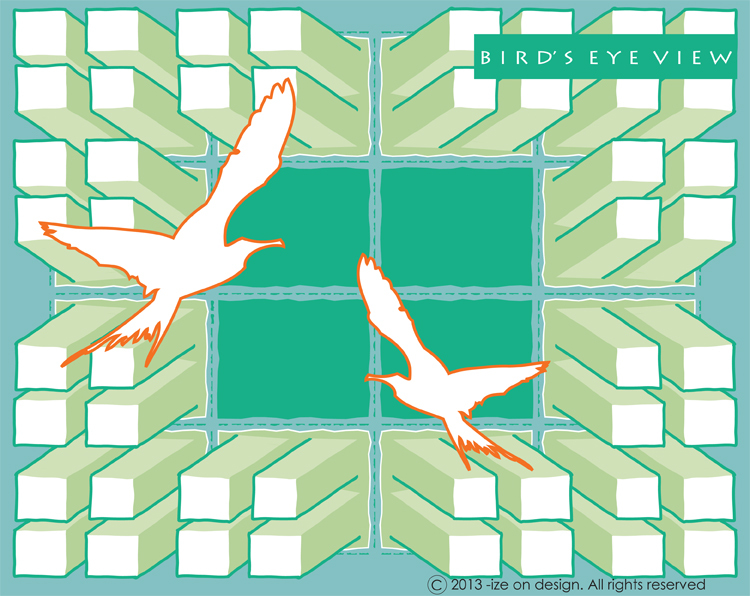 love the contrast between the organic movement from your birds and the geometrical shapes from buildings. Wish you lots of success in 2013! Thanks for your participation and thanks for the credit, really appreciate it. Great approach to the brief and lovely results! Wonderful, fresh and graphic, love them! Really love the colour palette too…how cool would they look as graphics on t-shirts! I love your unique take on the theme! Fab collection and great colours, too. Love the anchor pattern, it has a lovely “lifting up” spirit! Great collection Karen, birds eye view is my favourite! Great take on the theme, love your colour choice really!! fab as allways! Hello Karen, made a full circle blog hopping this weekend, sure was an inspiring activity for me. The bird theme showed up several times. And birds have always played an importand role in my life, stil do. ps. TURN THE SOUND OFF THERE ‘S A LOT OF WIND-NOISE !!! Thanks for drawing my attention to this Blog Hop. Karen I just love your designs and the perspective from which they were created! Your color palette is also fresh and uplifting! Best wishes to you and happy designing! Love your point of view of the theme! Great designs and colors! Best to you in 2013!! Very unique “perspective”, Karen! Really like your work— your style is definitely carved out and I like seeing all the product you’ve created! Pretty amazing art! Way cool pics and worth a pin!